We love the elegant look of 20s clothing at Backward Glances! 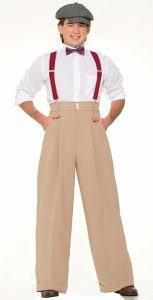 This is the page to find roaring 20s clothing for girls & guys. If you want to emulate the styles of Boardwalk Empire or Great Gatsby dresses, we’ve got the clothes and accessories, too. Perfect for themed parties or just if you feel like visiting a more elegant era. Most of our twenties styles are great quality reproductions, but check these pages for real vintage flapper wear, too. Here’s where you will find fringed dresses and everything you need to complete your twenties look, including headbands, gloves, stockings and cigarette holders. Plus a little history lesson about flapper girls and flapper style. From caps to spats and everything in-between to shop for your own personal Boardwalk Empire. We’ll also give you some great suggestions on where you can learn about men’s 20s clothing and gangster style.